The summer coastal fog has been light the past few days and I’m hoping for warmer weather through September, not just for my cold toes, but for the delayed tomato crop. Dry farmed tomatoes fresh from the farm…could there be a more delicious summer food? I’m happy not to see radicchio this week, since I have not used the heads from the past two weeks. Summer squash is one of my favorites. Substituting arugula and Asian greens in Tuscan-style Garlic Spinach worked great, so Tuscan-style Garlic Greens will make an encore appearance at the table this week. We’re perfecting a cilantro pesto recipe, so look forward to trying it again. I ordered some extra raspberries to try making a simple raspberry vinegar, and to eat as many of my favorite fruit as I can while it’s in season. Dare I try making raspberry jam? If anyone has leek ideas (without potatoes), let me know! Carrots with wheat germ? Or carrot pancakes? 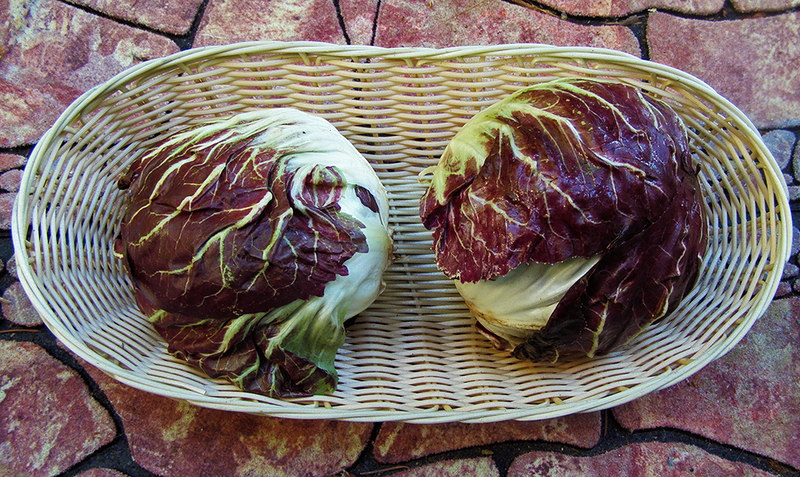 Sicilian Sauteed Radicchio: with leeks? Baked tomato sauce and pasta?